Users can choose between three different key formats depending on their personal preference: standard dichotomous keys; Lucid Phoenix interactive dichotomous keys; or interactive Lucid matrix keys. Although Lucid Phoenix keys are interactive keys they are still dichotomous and a choice needs to be made at each key couplet to continue. Lucid matrix keys, on the other hand, use a different approach where relevant states from multiple character features can be selected independently until identification is achieved. For more information concerning Lucid keys visit www.lucidcentral.org. DRAFT working key to subfamilies of Scelionidae in the old sense (adapted from Masner 1976). Excludes Platygastrinae and Sceliotrachelinae. DRAFT working key to World genera of Scelioninae (adapted from Masner 1976). To modify the key for a specific biogeographical region, click on the grey/blue funnel icon and select the region you are interested in. The key will be adapted automatically and will filter out extra-limital genera, simplifying and speeding up the identification process. Johnson, N.F. & Masner, L. 2006. Revision of world species of the genus Nixonia Masner (Hymenoptera: Platygastroidea, Scelionidae). American Museum Novitates 3518: 1-32. Taekul, C., Johnson, N.F., Masner, L., Polaszek, A., Rajmohana, K. 2010. World species of the genus Platyscelio Kieffer (Hymenoptera, Platygastridae) ZooKeys 50: 97–126. van Noort, S. 2008. South African survey reveals further Nixonia gems. Skaphion 2(13): 1-3. Yoder, M., Valerio, A., Polaszek, A., Masner, L., Johnson, N. 2009. 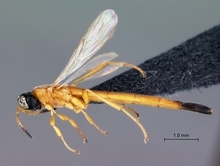 Revision of Scelio pulchripennis-group species (Hymenoptera, Platygastroidea, Platygastridae). ZooKeys 20: 53-118. (doi: 10.3897/zookeys.20.205). Keys produced by Simon van Noort under the auspices of the PBI Platygastroidea project (National Science Foundation grant No. DEB–0614764 awarded to to N.F. Johnson and A.D. Austin). Photographs included in the keys either © PBI Platygastroidea project or © Simon van Noort (Iziko Museums of South Africa).